Custom Scope Box- 21” (for .75 inch dia. 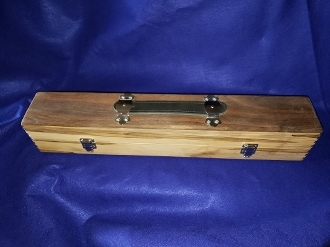 scopes up to 21” length) This is a custom hand made, box jointed, scope box for your optic investment. Walnut and Oak construction that securely holds your 3/4-inch target scope with felt covered no-mar mounts. Box utilizes a high quality leather handle and hardware, sporting an inner seal rim yielding a squeaky tight custom fit. Finish sanded and ready for your final finish. Custom Lengths available upon request, contact SPG Sales for a quote. Target scopes cost, as much or more than many rifles today, therefore your scope investment deserves quality protection. Made by a shooter for shooters.